Current control strategies for the major apple disease European canker (EC) are laborious and expensive, and often do not prevent progression of the disease, which can lead to loss of trees and therefore production. Hence, the development of resistant cultivars is a significant goal for breeders supporting growers in maritime climates conducive to the disease. With genetic markers increasingly being used as a tool in marker-assisted selection for parental and seedling selection, genetic mapping of major effect loci controlling resistance to the pathogen is integral to most breeding programmes. 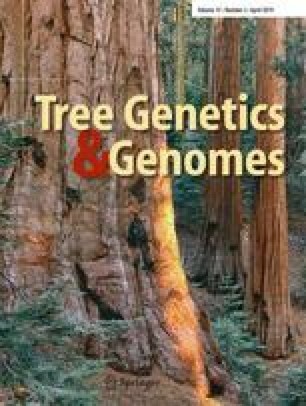 We report the genetic mapping of EC resistance in a bi-parental progeny derived from a cross between moderately EC-resistant ‘Malling 9’ (‘M9’) and highly resistant Malus ‘Robusta 5’ (R5) using two resistance phenotyping techniques. Field inoculation of rasp wounds on the stem and lateral shoots of replicated plants grown on their own roots with a suspension of Neonectria ditissima conidia proved both easier to perform and more effective than inoculation onto leaf scars. Rasp wound phenotype data combined with a previously reported genetic map enabled us to identify a large-effect QTL for control of resistance to EC on linkage group 14 of R5, which we named Rnd1. The position of this QTL was confirmed using leaf scar phenotyping data from the field and glasshouse inoculations. We have developed new SNP markers for this locus, using a novel bioinformatic SNP filtering tool that searches aligned genomic sequences of multiple apple accessions. We have converted one of these markers into a high-throughput version for application in marker-assisted selection of apple. The online version of this article ( https://doi.org/10.1007/s11295-019-1332-y) contains supplementary material, which is available to authorized users. The research was funded by Prevar™ and the Strategic Science Investment Fund from the Ministry of Business, Innovation and Employment. We thank Gail Timmerman-Vaughan and Jibran Tahir for critical reading of the manuscript. The complete data set for the summary of BLUPS data for the glasshouse and field evaluation of the M9×R5 family provided in Table 1 is presented in Supplementary Table 1. The genetic map of the M9×R5 has been submitted to GDR (https://www.rosaceae.org/node/1539159).